The Ivation food Dehydrator enables you to serve your family, with delicious home-made, healthy, wholesome food and snacks that is high in nutrients and low in calories! 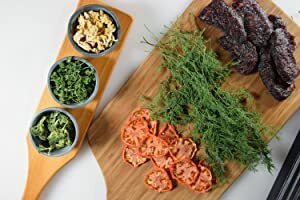 Make delicious meat jerky, fish jerky, crunchy green beans & dried sweet potato sticks, banana chips or dried apples with cinnamon, or any Variety of Fruits, Nuts, Herbs, Vegetables, And Meats. 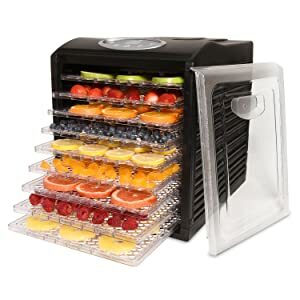 Dehydrating foods on your own will help you avoid the numerous chemicals and toxins that are often added in commercially-oriented dried fruits and vegetables. Uniquely designed with a 600w rear-mounted drying fan and air flow circulation technology to promote even drying without overheating, with no need to rotate the shelves. Choose drying temperatures from 95° F (35C) to 158° F (70C). Preset adjustable thermostat with automatic shutoff ensures that foods are dehydrated at their optimal temperature and crispiness, Up to 19.5 hours of dry time adjustable in 30 minute increments. 9 Adjustable Drying Shelves (13" X 12"), to contain Meat, Fish, Poultry, Beef, Fruits and Vegetables, Herbs and Spices, Trail mix, Snacks and more. Supports up to 1lb of food on each level. Solid and mesh sheets are included to use for smaller sized and liquid based foods. Use the included solid sheet to make Fruit rolls snack, tasty chewy fruit leather made from pureed fruit. Fruit rolls are easy to make and cost less than those bought at the store. Drying times may vary, depending on the type and amount of food, thickness and evenness of the slices, water in the food, humidity, temperature of air, altitude. Fruits, fruit rolls and vegetables: from 130°F to 140°F, this temperature range will help preserve vitamins A and C.
Meats and fish: should be dried on the highest temperature setting. Higher temperatures will keep bacteria and other spoilage micro-organisms, to a minimum during the drying process. Herbs and spices: from 95°F to 105°F, Try using fresh Herbs and spices before they begin to blossom. Make sure not to load trays too heavily as this will prolong the drying process.